Yahoo has reported a dip in its revenue for the second quarter due to weaker-than-expected advertising sales. The company said it generated $1.08bn (£670m) in revenue in the three months to June, a 4.6% decline compared to the same period last year. The data comes as Yahoo has been facing increasing competition from rivals Google and Facebook. However, despite a drop in revenue, Yahoo said its profits rose by 11% from a year ago to $237m. Carol Bartz, the chief executive of Yahoo said the second quarter was a "mix of good, encouraging and, at the same time, unsatisfactory" developments. "The issue was we did not have enough sales people in front of the big clients," she said. Increased competition from its rivals is the not the only issue that Yahoo has had to deal with. In May, it suffered a big setback in China after the internet company Alibaba, in which Yahoo has a 43% stake, transferred one its key assets, Alipay, to a company controlled by its founder ,Jack Ma. Yahoo shares have fallen more than 20% since then because investors are worried that it may have lost out on one of Alibaba's key businesses. The company has assured its backers that it is trying to resolve the issue. "We have been working on this negotiation continuously, in fact daily," said Ms Bartz. 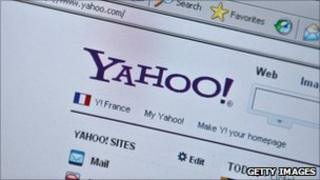 However, analysts said the latest data indicated that Yahoo will find it tough to turn things around soon. "They are trying to fix a lot a problems that do need to be fixed, but unfortunately as they are fixing those problems, new ones are popping up," said Ben Schachter of Macquire Research. "At the end of the day it's another disappointment," he added.